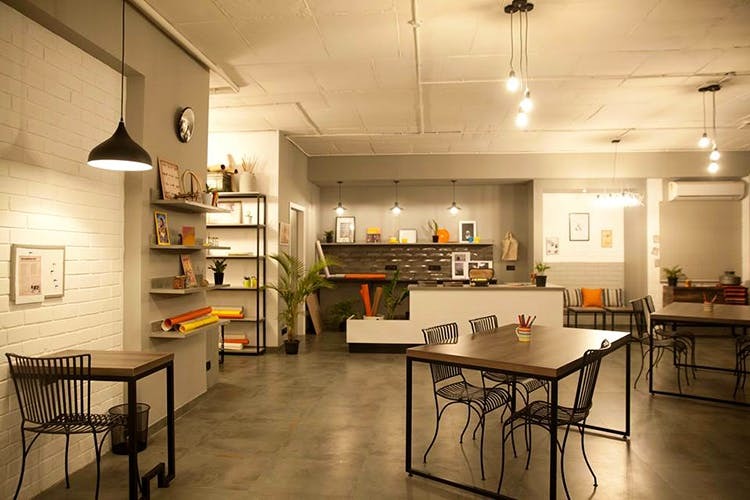 A quiet and very chic spot by Sankey Tank, Blank Space is a new co-working spot that will have you hot desking it in no time. We hear there is unlimited stationery too! Whether you’re the dreaming artist, the budding entrepreneur or someone already helming a solid business, Blank Space could well be where it all began. Tucked away in the quiet Sadashivanagar, just across Sankey Tank, we love the casual vibes that are conducive to work here. Created to look like a swish apartment, the place has a mix of seating — from what could be a dinner table to couches with colourful cushions, and a balcony area filled with tables and chairs. The walls have shelves which are filled with interesting artefacts, accessories and décor ranging from nautical charts, desk globes, framed art and photos and even a few mirrors. There’s a wall with single desk set-up with old school lamps lighting up your work area — possibly my fave spot in the house, so if you want to work in solitude, that’s fine too. The best part though, is that you aren’t restricted to one spot. Just move around as you please, to meet new people and to change your view. You never know where inspiration comes from eh? Oh, and it isn’t only a table to work at that you get. Naturally, in the Silicon Valley and Start-Up City of India, super hi-speed WiFi is a given. Plus, unlimited coffee and stationery to set you on your path to greatness. Plus, co-workers to build your network, or even just make new friends to hit up the bar with post work. If you’re looking to host workshops or a meeting, call these guys and book a room. In fact, they even accommodate social events. Sounds ace, right. Go on, ditch the cubicle. You won’t regret it.